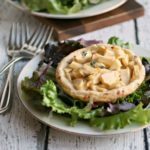 A recipe for Apple and Gorgonzola Biscuit Tarts made with a homemade dough and filled with apples, spices, and gorgonzola cheese for a delicious dessert. To make the biscuits, add the flour, baking powder, salt and pepper to a large bowl. Using a pastry cutter or fork, cut in the butter until the mixture resembles course crumbs. Add the crumbled cheese and then make a well in the center, add the buttermilk and slowly incorporate it into the dough. Form into a ball, wrap in plastic and refrigerate for at least 1/2 hour. When the dough is ready, roll it out to about a 1/4" thickness (thinner than you would for a biscuit) and cut out 4 equal circles. You can bake these in any individual sized pan (I used a small tart pan). Drape each dough circle over your pans. Make the filling by adding the apples, maple syrup, lemon juice, thyme, flour and salt to a bowl and mixing until combined. Place equal amounts of apple filling into each of your four pans and bake in a pre-heated 375 degree oven for 20 - 25 minutes. Serve over salad for a great lunch.